“Diastello are an in demand line-up of experienced professional musicians from different disciplines who offer a fine and musically versatile service”. A member of the most entertaining and established UK based Greek band, Diastello since 2000. As well as performing for weddings and corporate functions the band on occasions have accompanied famous and established Greek solo artists during UK tours. They are principally active in London and regularly perform in some of the city’s most prestigious banqueting venues, as well as covering many others across the UK. Over the last twenty-five years the band have built an extensive and impressive repertoire in Greek, Pop/ Urban, and Easy Listening genres. 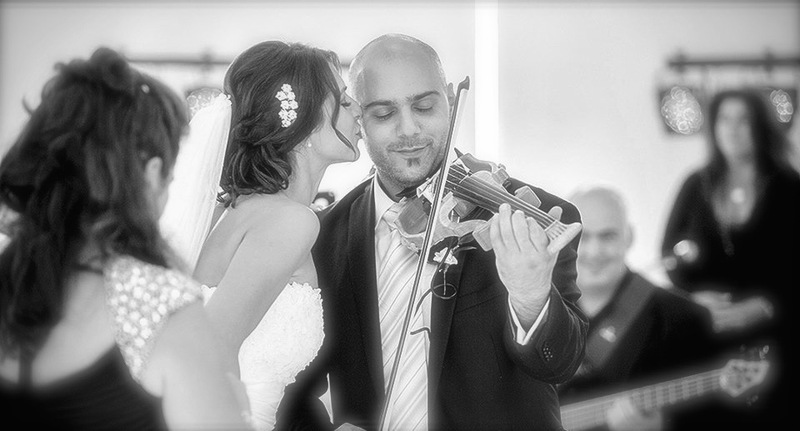 The violinist plays a prominent role throughout the whole day of a Greek wedding. They are principally involved in cultural traditions consisting of symbolism and ritual. Some of these take place before the church ceremony in the morning. Many other traditional folk pieces and dances are also performed by the violinist during the evening reception. “A truly memorable day where quality music is rooted with tradition. Customs and modern entertainment come together”. With many years experience in this field a service of the highest quality to cater for all aspects of the Greek wedding day are delivered with professionalism. Ranging from the traditional “Stolisma” ceremony, the “Grand Entrance” at the venue, the traditional “Money Pinning” dance and a range of Popular Greek music are all significant parts of the day. He has successfully fused tradition with the current and has contributed in shaping the format of the contemporary Greek wedding.